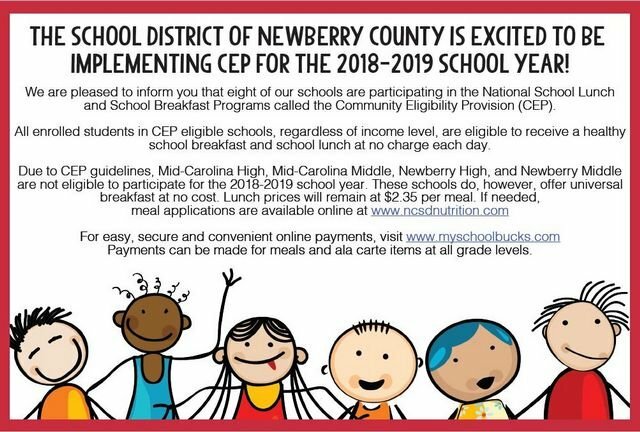 The School District of Newberry County is excited to be implementing CEP for the 2018-19 School Year. We are please to inform you that eight of our schools are participating in the National School Lunch and School Breakfast Programs called the Community Eligibility Provision (CEP). Due to CEP guidelines, Mid-Carolina High, Mid-Carolina Middle, Newberry High, and Newberry Middle are not eligible to participate for the 2018-19 School Year. These schools do, however, offer universal breakfast at no cost. Lunch prices will remain at $2.35 per meal. If needed, meal applications are available.